Space is the name we have for the volume that encompasses the whole of eternity, the vast distances that sperate the objects we know collectively as the universe. Some stars and planets have been known to mankind since thousands of years ago. It wasn't until recently, in the last few hundred years or so, that we have really started to explore space and discovered there is so much more than we could ever imagine or witness with our unaided eyes from here on Earth. Select from the Menu above to find out about the Solar System, Deep Space and Space exploration. 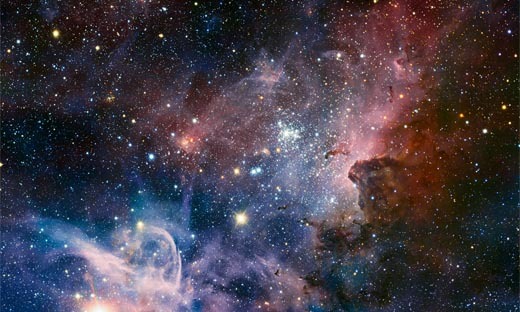 The Carina Nebula taken in Infra red.